This week an 81-year-old man was assaulted in a New Jersey supermarket for wearing a MAGA hat. The 81-year-old man was at a ShopRite on Elizabeth Avenue when a far left extremist started abusing him about his MAGA hat. Prosecutors said that the elderly man was left with minor injuries and declined any treatment. The assault is currently under police investigation and it is not clear at this stage whether the assault was caught on surveillance tape. No arrests have been made and prosecutors did not provide any details about the suspect either. Every single day Trump supporters are abused, attacked or discriminated against by the left that still has the nerve to call themselves “tolerant”. And there’s plenty more cases. Not to mention the hundreds of thousands of abusive Tweets daily. But, while the attacks happen daily, the media and the left give more time to fake crime hoaxes, bashing Trump and his supporters. Everyday across America since election night multiple cases of where people claimed to have been beaten or attacked by “racist” Trump supporters, are actually proven to be false by law enforcement or even the accusers themselves. 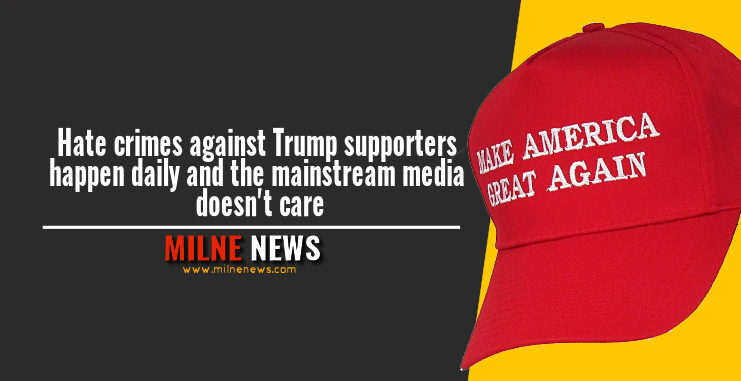 Leftist groups and leaders are just busy pushing out hundreds of false claims of Trump supporters committing violence against minorities and minority ethnic groups in America, because it’s actually the left committing violence on Trump supporters.